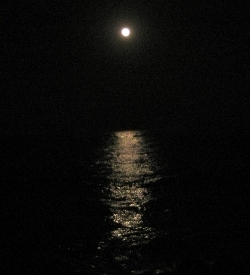 Don't you just love walking on the beach when the breeze is warm and the moon is full? I sure do. It would be even nicer to share it with someone other than my dog, Duffy, but even so . . . such beauty should be savored. It's so nice out today, I'm looking for excuses to be out of doors. Maybe I should get back to painting a second coat on the new fence? The weather report for the northeast just reinforces my pleasure at being where I am. Can you imagine? Boston has already spent over $16 million on snow removal and they are expecting another 20 inches tonight? And just think of all the flight cancellations. That doesn't portend well for discount flights any time soon. Okay, enough procrastination - time to get back to outlining my new book and filling out the characters so I can start writing again. Stay warm, dry and safe everyone.